By far the most popular tool to help track website performance is Google Analytics (GA). With over 30 million websites* currently using Google’s free program it is clearly the preferred choice for marketeers worldwide. Whether you want to track which campaigns drive the most visitors to your website, what pages they look at, or whether they convert to a lead / purchase, Google’s tool can be configured to track the information you need. Knowing which channels and campaigns drive high value orders can provide invaluable insight. It also helps provide more transparency on your return on investment when measuring activities like pay-per-click, as Google Adwords cost data can be automatically imported into GA, and similarly GA can feed transactions into your Google Adwords account. A few years ago Google brought out a new enhancement for their analytics product, aptly called Enhanced E-commerce. This is only available for websites running the newer version of the Google Analytics library (Universal Analytics) and offers a variety of powerful features over and above the standard e-commerce tracking. Allows ‘funnel analysis’ so you can see exactly where people abandon their cart. For example, do 50% of your users stop at the payment stage, or are most dropping off after viewing a page with product details? The funnel analysis is what we consider the most powerful feature. Being able to easily identify segments of users based on where they exit, and those that progress through to purchase, this allows detailed analysis on what other attributes these segments of users share. Often, people won’t complete a purchase on their first visit, so you can drill down to see if returning visitors are more likely to convert. 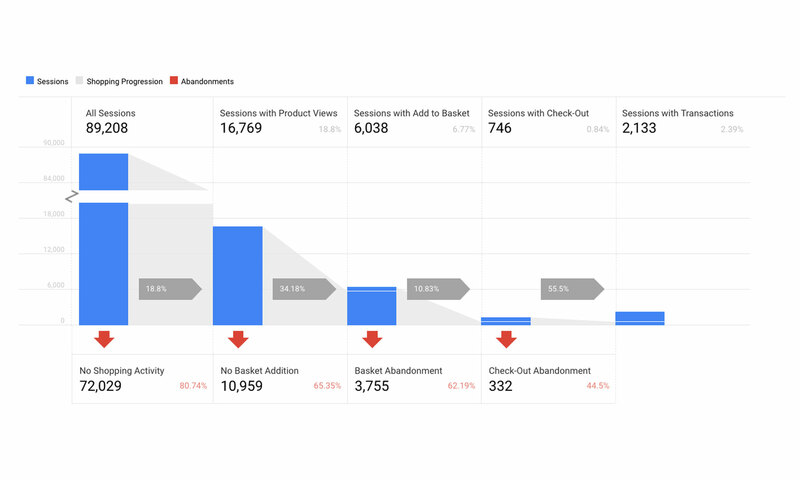 Unfortunately, not all visitors will return, so that is where the funnel analysis can be used to build audiences to use for remarketing. Hopefully you found this breakdown on the differences between E-commerce and Enahnced E-commerce useful. If you need help getting your Google Analytics set-up or configured please get in touch.